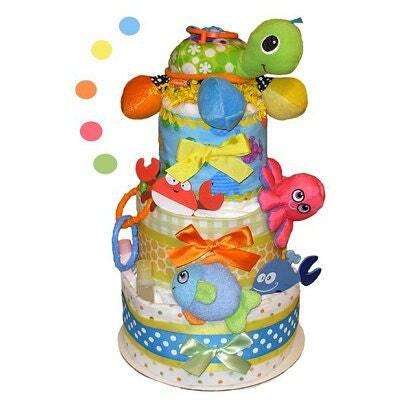 This fun, colorful 3 tier Sea Life Diaper Cake (Under The Sea Diaper Cake) features a sweet plush activity Turtle stroller toy and is "loaded" with high quality baby items and of course, lots of diapers! The new parents will be delighted to receive this impressive Sea Life Diaper Cake (a.k.a. baby cake, baby shower cake). 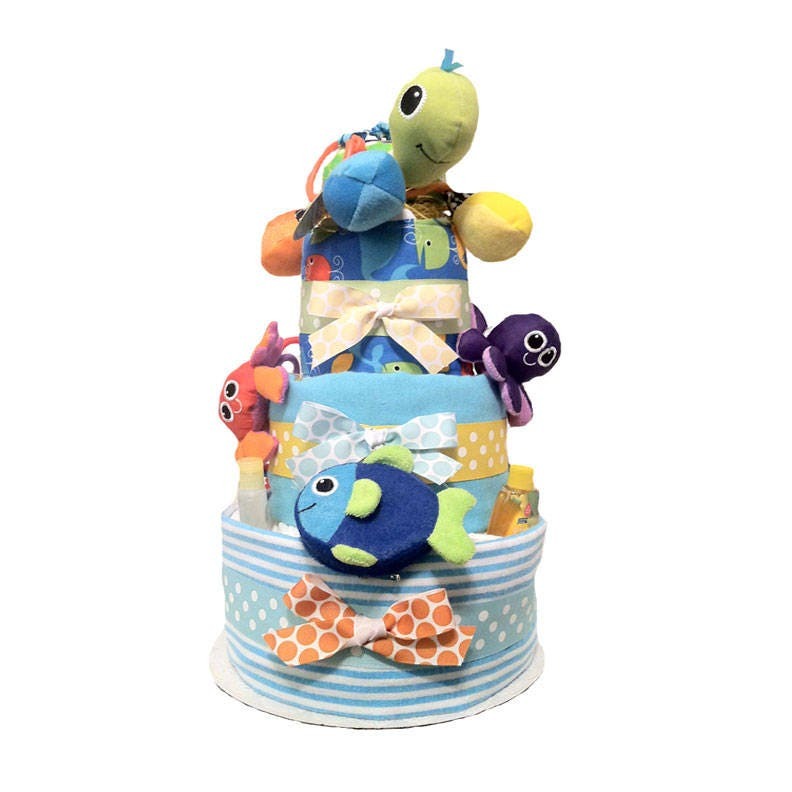 Our Sea Life, Under The Sea theme Diaper Cake is very popular and can easily double as a unique gift and Baby Shower Centerpiece all-in-one. Measures approximately 17"h x 10" dia. Arrives beautifully wrapped in clear cellophane to make a big impression. This is a handmade, hand-assembled product and some minor variations and/or substitutions are possible. In the event a substitution is necessary because a content item is out of stock or has become unavailable, you can rest assured it will match the theme/style and will be of equal or greater quality and value. This is a Tumbleweed Babies Original product. All rights reserved. If ordering for a baby shower, we suggest removal of the outer cellophane packaging and displaying the diaper cake on a cake pedestal to achieve the best visual impression. Diaper cakes work really great as table centerpieces and also look fantastic displayed on gift tables, food tables.etc.